Pegasus Ventures Michigan’s served Swift Notary in Kentwood, MI serving the metropolitan Grand Rapids area for 4 years. For now over 4 years Pegasus Ventures Michigan delivers for Swift Mobile Notary based in Kentwood, Michigan serving the Grand Rapids metropolitan area with regular updates, revisions and improvements to the owner’s responsive website. 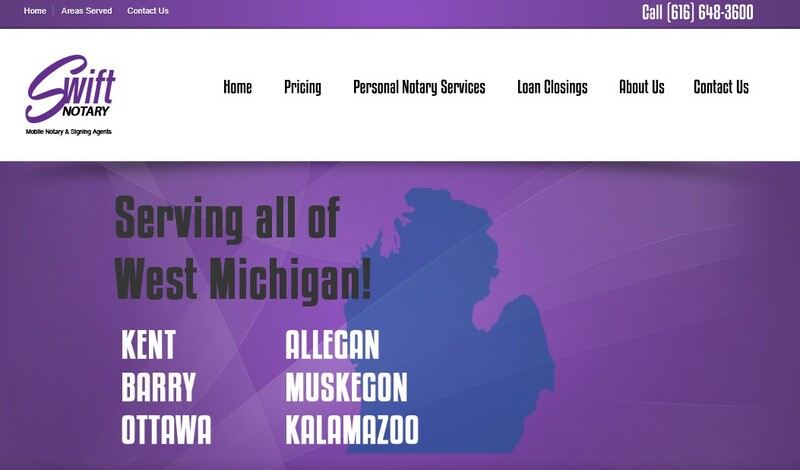 Picking up this client following a poor experience with another webmaster, Pegasus Ventures Michigan gets results using current search engine optimization best practices achieving results for this very experienced mobile notary public. Pegasus Ventures Michigan also helped the owner transfer her domain name and hosting from the control of the previous webmaster to her own account on GoDaddy consequently the annual costs. Now the owner entirely controls her own website independent of Pegasus Ventures or any future web designer. As with all Pegasus Ventures Michigan managed websites Swift Mobile Notary services enjoys a responsive design meaning the website works across all platforms, including tablets, smart phones as well as traditional desktops and laptops. And who says notaries public aren’t fun people? Check out this owner’s other business, also with a Pegasus Ventures Michigan designed website, Swift Photo Booth Rentals.